Arthur Winston Crane (known as Winston) was born in Perth on 21 August 1941, one of seven children of farmer Arthur Crane and his wife Lavina, née Longman, from Bindi Bindi in the wheat belt north of Perth. Winston Crane's uncle, Albert (Bert) Crane was a longstanding Member of the Western Australian Legislative Assembly representing the constituency of Moore for the National Country Party (1974–85) and as a Liberal (1985–89). Crane attended the local primary school and later boarded at Guilford Grammar School in Perth. He later explained: 'I had left school before I turned 15. I had to, otherwise my next brother could not go to school. Things were tough then, and they were very tough out on the land'. After leaving school Crane worked as a contractor and a shearer for twenty years. With funds saved from shearing, he was able to purchase a property in the Jerdacuttup district, west of Esperance, some 600 kilometres from Perth. Crane married twice. He had three sons with his first wife and a daughter with his second. He married his second wife, Thea White, on 7 October 1994. Thea had been Crane's secretary for eight years prior to his taking office in the Senate and continued in this capacity over the duration of Crane's parliamentary career. Crane admitted that as a young man he was 'a bit wild' and 'certainly prepared to challenge authority'. However, he also acknowledged that he had learned from his 'fairly strict father ... that you changed things from the inside; you rarely did it from the outside'. With this in mind, he established a branch of the Farmers' Union of Western Australian in Jerdacuttup. By 1973 he had become a member of the executive of the Union, rising to Senior Vice President (1981–82) and then to President of the same body when it had changed its name to the Primary Industry Association (1982–87) and then to the Western Australian Farmers' Federation (1987–89). Crane was the youngest president in the history of the Western Australian Farmers' Federation. From 1978 Crane also held executive roles in the National Farmers' Federation, reaching the level of Senior Vice President (1987–89). In these capacities, he was involved in some high-profile industrial disputes—the 'wide-comb dispute', which pitched the federation against the Australian Workers' Union (representing shearers), the Mudginberri abattoir meat packing case and the CBH Geraldton wharf dispute. From 1982 Crane also acted as a director and chairman of various agricultural companies, taskforces, funds and committees. In 1989 Crane resigned his farmers' federation positions, accepting the endorsement of the Liberal Party at the third spot on the party ticket as a Senate candidate for Western Australia. 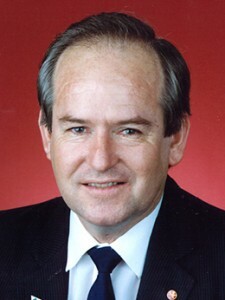 Subsequently, Crane was the fifth person elected to the Senate from Western Australia in the general election of March 1990. His term commenced on 1 July of that year. In the 1996 election he held his seat, being the first person elected to the Senate from Western Australia. We must also pursue relentlessly the Asian opportunity. In Asia an economy the size of Japan's is growing every 18 months. It is predicted that this will continue for at least 30 years. It is in this area that Australia's trading future lies. To take advantage of it we must out-compete other countries around the world. While in Opposition Crane held positions in the shadow ministry. He was secretary to the shadow cabinet (1993–94) and parliamentary secretary to the Leader of the Opposition in the Senate (1994–96). Over his two Senate terms he served on a range of committees, but his background and interests naturally drew him to committees dealing with rural and regional affairs. Crane joined the Rural and Regional Affairs and Transport References Committee in 1994 and the legislation committee in 1995 and from May 1996 he was both chair of the legislation committee and deputy chair of the references committee. In 1997 he said that his vision for the committee pair was that it should aim to protect the rights of the individual so as to best promote commercial viability. Australian Democrats Senator Andrew Bartlett (Qld) described Crane as a chair who 'was willing to listen to other views, to reach consensus and not just be forced into submission by having to toe the government line'. In the Senate chamber Crane participated in debates on a range of bills, directing his attention to industrial relations, transport, environmental conservation and primary industry, including matters pertaining to agricultural research and development and trade. He often spoke about the wool industry and took a special interest in wool marketing and the 'wool tax' legislation of the early 1990s. Crane was also an active commentator in the media on matters such as the privatisation of Telstra and the growing problem of the wool stockpile and the collapse of prices received by graziers. In early 1997 Crane was named in a media report as one of several Western Australian parliamentarians who had been asked to explain their use of allowances to send direct mail and newsletters during the previous year's state election. All claimed that they had not breached requirements. Tensions within the Western Australian division of the Liberal Party were further fueled by the need to fill the casual vacancy left after the unexpected death of Western Australian Senator John Panizza on 31 January 1997. In February 1998, at an estimates hearing of the Environment, Recreation, Communications and the Arts Legislation Committee, the Minister for the Environment, Senator Robert Hill (Lib., SA), told the committee that Crane had been in the room when he had allocated National Heritage Trust grants in Western Australia. Hill explained that as Crane had previous landcare experience, he was 'used' to provide background information on Western Australian community groups. It was noted at the time that ninety per cent of the grants had been allocated to regions represented by the Coalition. A press article some days later also claimed: 'Part of a property owned by Western Australian Senator Winston Crane and his son is involved in a landcare project that has been awarded a Natural Trust grant'. In response, Crane gave a personal explanation to the Senate on 3 March 1998, stating that although ten per cent of the property (some 240 hectares) fell within the relevant catchment area, his son, who ran the farm, had not applied for a grant and the family property would not receive any Natural Heritage Trust grant funding. While media interest in this matter subsided, the following year presented fresh challenges. In January 1999 Crane confirmed that the Australian Federal Police (AFP) was conducting an investigation into alleged misuse of his parliamentary travel allowance related to payments made and claimed for charter flights taken by Crane from 1995 to 1998 between Perth and rural districts in Western Australia. The media reported that as part of the investigation the AFP had sought warrants in Perth and Canberra to search and seize documents from Crane's Perth electorate office, from Crane's office at Parliament House and from premises in Jerdacuttup. The investigation was interrupted when Crane commenced an action for a Federal Court injunction to challenge the validity of the search warrants and to claim parliamentary privilege in respect of documents seized from his parliamentary and electoral offices. The challenge to the validity of the warrants was abandoned, but Crane maintained the action on parliamentary privilege grounds with a mind to seeking a declaration as to his entitlement to the relevant payments under his travel allowance. On the matter of parliamentary privilege, a written submission to the court was made on behalf of the President of the Senate, Senator Margaret Reid (Lib., SA), incorporating a letter to her from the then Clerk of the Senate, Harry Evans. The submission advised that: 'In order to invoke the immunity against production of documents, the documents in question would have to be closely related to proceedings in Parliament such that they would fall within the expression used in the Parliamentary Privileges Act 1987, "for purposes of or incidental to" proceedings in Parliament'. From this, although Justice French inferred that documents relating to travel itineraries would not fall within such a protected class of documents, he found that the issuing of search warrants was an executive act, not a judicial act, and therefore the question of whether parliamentary privilege applied was a matter to be determined by the relevant House of Parliament (in this case the Senate). Justice French concluded that he could not rule on whether Crane was entitled to the travel payments, instead ordering that the relevant documents be delivered to the Clerk to be dealt with according to the directions of the President. On 5 December 2000 the Senate appointed Mr Stephen Skehill SC to examine the documents to determine whether any were immune from seizure by virtue of parliamentary privilege, with those documents not considered immune to be forwarded to the AFP. Odgers' Australian Senate Practice comments that the aspect of the judgment relating to privilege 'was not appealed and is unlikely to be regarded as authoritative'. While the police investigation continued and as preparations for the federal election due that year were finalised, earlier tensions in the Western Australian division of the Liberal Party resurfaced. The press reported that, after a dispute over positions on the Senate ticket, Crane was being relegated from his previously held first position to fourth spot on the party ticket. In July 2000, at the Western Australian state conference of the Liberal Party, Crane attempted to have that decision overturned, but with no success. Crane subsequently stood as the fourth Liberal candidate on the ballot paper at the half-Senate election held on 10 November 2001 and was defeated. Crane later indicated that he believed that members of his own party in Western Australia had conspired in this matter to sink his political career; a media report in December 2001 claiming that some of the allegations may have been fabricated came too late to save his political career, though the outgoing senator continued the fight to clear his name. Crane was eventually vindicated in 2002 when the Minister for Justice and Customs, Senator Ellison, announced that the AFP had concluded its investigation into Crane's travel claims and that the Commonwealth Director of Public Prosecutions had concluded that there was insufficient evidence to support the allegations. In his valedictory speech on 27 June 2002, Crane recalled his early years, thanked fellow senators and staff and acknowledged the satisfaction that he had gained from committee work. The only mention he made of the difficulties that he had faced was brief: 'I am not sorry in some ways to be leaving here; what I am sorry about ... is the way it was done'. Liberal Senator Alan Eggleston (WA) described him as 'the most genuinely agrarian senator we have in this place ... a true Liberal ... not one of those agrarian socialists who we are in coalition with, may I say. He is a believer in the free market'. 'Profile: Senator Winston Crane', House Magazine, 30 Oct. 1991, p. 2; WAPD, 19 Aug. 2003, pp. 10155–6; CPD, 27 June 2002, pp. 2917–21; Sun Herald (Syd. ), 10 Feb. 2002, p. 30; WA Farmers, The Western Australian Farmers' Federation: Representing WA Farmers for 100 Years, Burswood, WA, 2012, pp. 10, 12; Department of the Senate, Committee Bulletin, Canberra, 1997, p. 5; CPD, 8 April 1998, p. 2381, 21 Feb. 1991, p. 1064, 21 Oct. 1993, p. 2365. CPD, 14 Sept. 1990, pp. 2328–33. CPD, 7 May 1991, pp. 2791–3, 7 Nov. 1991, pp. 2699–702, 3 Nov. 1992, pp. 2122–4, 28 Oct. 1993, pp. 2784–8, 27 Feb. 1992, pp. 331–3, 30 Nov. 1992, pp. 3817–9, 9 March 1995, pp. 1698–700, 20 Dec. 1990, pp. 6142–3, 21 Feb. 1991, pp. 1044–6, 26 March 1992, pp. 1243–6, 24 Aug. 1999, pp. 7643–6, 18 Oct. 1990, pp. 3360–3, 7 Nov. 1990, pp. 3645–6, 29 Nov. 1990, pp. 4750–2, 20 Feb. 1991, pp. 887–9, 904–5, 955–60, 6 March 1991, pp. 1238–42, 18 June 1991, pp. 4885–8, 6 May 1992, pp. 2293–5, 24 May 1993, pp. 1110–13, 1131–2, 24 June 1996, pp. 2072–4, 28 Sept. 1999, pp. 9045–6; Australian (Syd. ), 9 July 1998, p. 1; Media Release, Senator Winston Crane, 24 June 1996; AFR, (Syd. ), 8 Aug. 1998, p. 2. WA (Perth), 5 March 1997, p. 6, 14 March 1997, p. 6, 27 Feb. 1998, p. 24, 3 March 1998, p. 2; CPD, 3 March 1998, pp. 179–80. WA (Perth), 18 Jan. 1999, p. 1; CT, 19 Jan. 1999, p. 1; WA (Perth), 10 March 1999, p. 5; Crane v Gething  FCA 45 (18 February 2000), 762, Full Court (2 June 2000); Senate, Journals, 13 March 2000, pp. 2423–4, 5 Dec. 2000, pp. 3726–7; Harry Evans & Rosemary Laing (eds), Odgers' Australian Senate Practice, 13th ed., Department of the Senate, Canberra, 2012, pp. 60–1; CPD, 27 June 2002, pp. 2779–81. Transcript, ABC Radio, 'AM', 14 June 2001; WA (Perth), 28 July 2001, p. 4, 5 Dec. 2001, p. 14, 14 Nov. 2002, p. 1; CPD, 27 June 2002, pp. 2868–922. This biography was first published in The Biographical Dictionary of the Australian Senate, Vol. 4, 1983-2002, Department of the Senate, Canberra, 2017, pp. 551-554.